In honor of their 100-year anniversary, BMW just unveiled the car of the future. The BMW Vision Next 100 features augmented reality dashboards, a shape-shifting exterior, and a “Companion” that acts almost like artificial intelligence, learning about the owner of the car to “perform routine tasks” and “offer advice.” The vehicle could totally transform your daily commute - imagine getting caught up on your favorite TV show or watching a nature documentary on your way to work. The BMW Vision Next 100 is an ambitious concept that isn’t production-ready, but does offer a stimulating glimpse of what cars could look like in the future. The vehicle’s designers drew upon digital technology to enhance a driver’s experience and performance. “Our goal was to create a very personal vehicle. There will always be that highly emotional connection between a BMW and its driver,” said Karim Habib, Head of BMW Automobile Design. The car has two modes – in Boost Mode, the driver is responsible for operating the car; in Ease Mode, the car drives itself. The seats can rotate so passengers can face one another, and instead of watching the road, passengers can watch entertainment on the windshield. A concept called Alive Geometry takes the design one step further: 800 small triangles on the exterior move for prime aerodynamics, and inside the car the dashboard alerts drivers to road conditions via augmented reality. Perhaps the feature most akin to science fiction is the Companion, an artificial intelligence which gathers information on the car’s driver to provide advice and even accomplish some chores. “If, as a designer, you are able to imagine something, there’s a good chance it could one day become reality,” said Adrian van Hooydonk, BMW Head of Design. The last 100 years have brought immense, thrilling changes not only for BMW but the car industry as a whole. With the recent push towards sustainability, it will be exciting to see where the car industry heads in the future. BMW's car of the future blends digital intelligence with functionality. 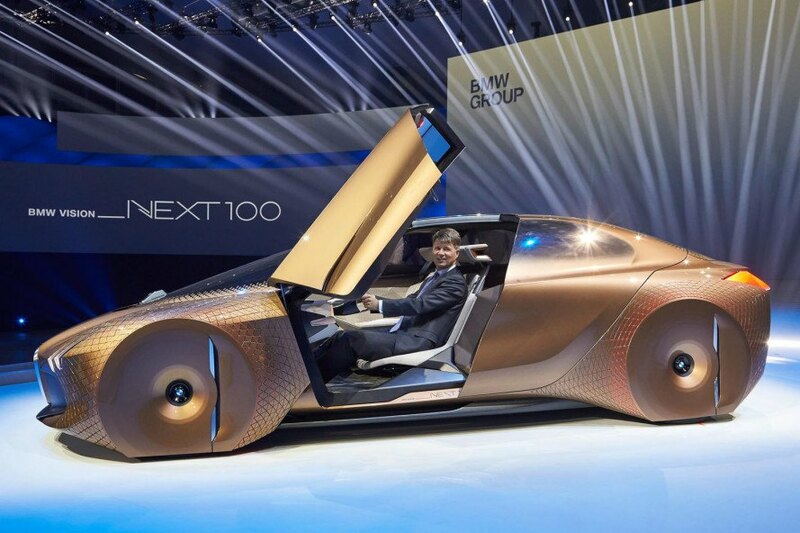 BMW's Vision Next 100 celebrates their first 100 years and looks forward to the future. BMW's Vision Next 100 offers features straight out of a science fiction movie. BMW's Vision Next 100 changes the way we view cars. The Vision Next 100 reveals BMW's dreams for the future in a changing industry. BMW's car of the future was designed with passenger comfort and entertainment in mind. BMW's Vision Next 100 offers a dashboard that incorporates augmented reality. The windshield of BMW's Vision Next 100 could provide updates and statistics for drivers. Drivers can operate the Vision Next 100 on their own or allow the car to take over.